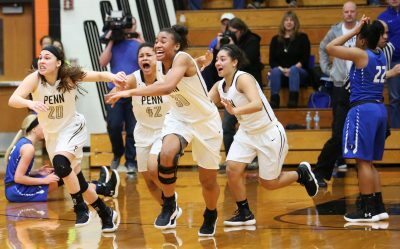 Sara Doi hit a driving lay-up in traffic with 4.5 seconds left, and the Penn High School Girls Basketball Team held on for a stunning 43-41 victory against Lake Central to capture the Class 4-A Regional Championship at LaPorte on Saturday, Feb. 10. 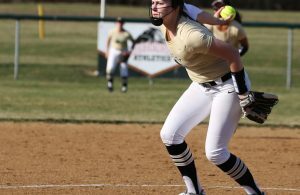 Penn (26-1) avenged its only loss of the season with the victory. Lake Central beat Penn, 51-43, on Nov. 18. Lake Central’s season ends at 22-7. 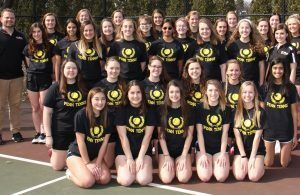 Coach Kristi Kaniewski Ulrich’s Kingsmen advance to the Valparaiso Semi-State on Saturday, Feb. 17. 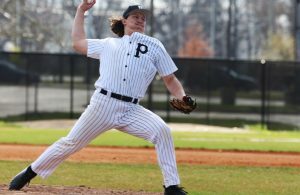 The Kingsmen play Zionsville (21-5) at 3 p.m. ET. Penn trailed by as many as 11 points. Lake Central led 41-39 when Tia Chambers hit a lay-up with 1:43 left. Chambers scored all six of her points in the final quarter. Freshman Jordyn Smith finished with 12 points, and Doi scored 11. Penn beat Elkhart Central 52-48 in the first game. Sara Doi scored 13 points, and Tia Chambers and Trinity Clinton scored 12 points each.